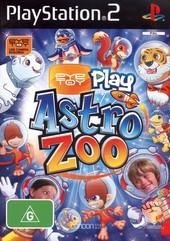 The latest addition to the EyeToy franchise arrives on the PlayStation 2 entitled "Astro Zoo" that contains the greatest collection of Earth animals to have been collected. Unfortunately for the Zoo, disaster strikes and all the animals are now on the loose thanks to a meteor shower. The gamer... well, the young gamer is transformed into a Space ZooKeeper and their job is round up all the animals before the opening day. 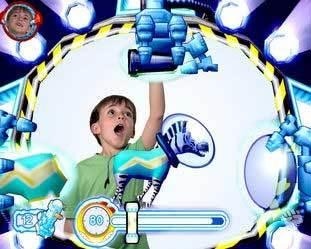 The EyeToy franchise has always been targetted towards children and this current incarnation is much the same. The player uses a USB camera that has been connected to the PlayStation 2 which allows them to interact with the gaming environment thanks to the motion sensor software. 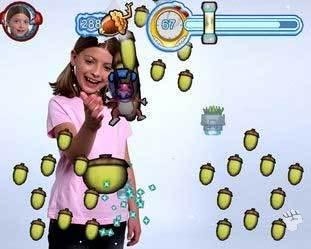 Feeding squirrels or catching frozen bunny rabbits are just some of the games of this current version of the popular EyeToy franchise. There are virtually a myriad of mini-games in this title that will have the younger gamer coming back for more. For the older gamer, I would avoid this title like the plagued as it's definitely a children's game. Graphically, the title is rather simplistic as the majority of the screen is taken up by the gamer itself. Needless to say, all the animations are bright and look like they have been taken from a Saturday morning cartoon show with some great cell-shading effects. Match that with some catchy music and some sometimes extremely repetitive sound effects and this title will definitely keep the younger gamer entertained. In conclusion, EyeToy Play: Astro Zoo is a simplistic EyeToy game that does not provide anything new to the genre and the games are rather similar to the previous versions. Definitely a good Christmas present for the younger gamer!